I accidentally lost important files from a USB flash drive. It's very important to me, how can I restore it? USB flash drives are portable and small in size and can be carried around with Plug and play. However, due to physical damage and improper use of USB flash drives, they typically cause file loss. To restore important files from a USB flash drive, you need to stop using it because you might overwrite the data. In addition, look for a USB flash drive data recovery software that can safely recover your data. Like Bitwar Data Recovery Software. This efficient and useful tool will allow you to retrieve data like photos, videos, music, document files, archive files from computer, external hard drive, USB flash drive, SD Card, etc.Free download USB flash drive data recovery software for windows 7：https://www.bitwar.net/data-recovery-software/ . ●You can recover lost or deleted files, photos, audio, music, emails from any storage device effectively, safely and completely. ●You can recover data from recycle bin, hard drive, memory card, USB flash drive, SD card, digital camera and camcorders. ●Supports to recover data for sudden deletion, formatting, hard drive corruption, virus attack, system crash under different situations. ●Preview before recovery allows you to make a selective recovery.You can preview lost files, including common photos, Word, Excel, PDF, CAD, RAR, PSD, etc., as many as 300 different file types. ●Supported OS: Windows 10/8/7/XP/Vista, Mac OS X (Mac OS X 10.6, 10.7 and 10.8, 10.9, 10.10 Yosemite, 10.10, 10.11 El Capitan, 10.12 Sierra) on iMac, MacBook, Mac Pro etc. Free Download and install Bitwar Data Recovery software on your windows 7, launch it and follow the step by step guide and recover deleted files from USB flash drive.DO NOT save other files or install softwares to the USB flash drive where you want to recover files. 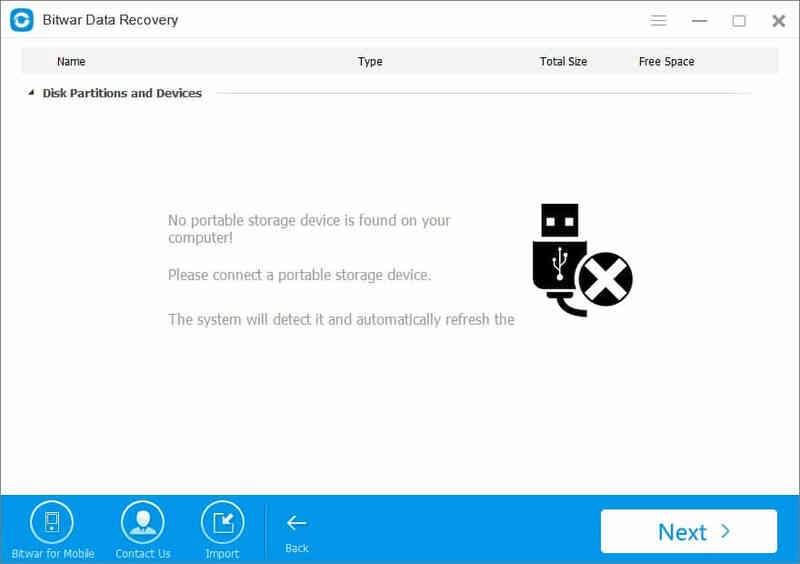 On the main page of the Bitwar data recovery program, you can see 6 different recovery mode, and each of them focuses on different data loss scenarios. Please select “USB/Memory Card Recovery” when you want to recover Files from USB flash drive. Please ensure that your USB flash drive can be well connected with your computer and select it,click on the butten ”Next”. Bitwar data recovery helps in recovering the different multimedia files which includes your cherished photos, audio, videos and all useful file types.you can select "Select All Types" to start scanning. During the scanning, you can preview scanned images, videos, music, documents and etc before restoring delete files from recycle bin.Once you found the deleted files which you need, please stop scanning process and click “Recovery” button. Then you will be notified to select a path to save the files. Here, you'd better save all the recovered files on a different drive or device in case of data recovery failure. After the scan, The found content will be displayed in the middle window area.you can filter through the file name, type, path, and time in the tree list on the left. you are able to preview them before recovery too. Plus, You can also export all scan results to a specific location after a scan, so that you can load previous results without a rescan when you need it.But please do not export results to the location where data loss appears, because it may overwrite lost data. Next：Can you recover formatted files from USB flash drive & Pen drive?